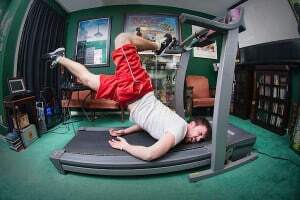 Treadmill Ratings Reviews / Blog / Blog / 15 Most Hilarious Treadmill Fails of All-Time! So, without further ado, we give you the 15 Most Hilarious Treadmill Fails of All-Time! There’s nothing quite so humiliating as getting into your groove for the camera only to be upended — in this case, quite literally — by an unforeseen circumstance. Here, that “unforeseen circumstance” is a treadmill going a bit too fast for its rider. Thankfully, no one depicted in this video, which originally appeared on YouTube via user FunnyChapina, was injured — physically anyway. Pride? That’s a whole other story. As if the initial treadmill fail wasn’t bad enough, watch what happens when the poor break dancer tries to get up. You’ve got to give him credit, though. He certainly doesn’t let it stop the beat. This little guy probably should have known better when he tested the band with his foot only to have the speed almost take his leg off with it. When he tried to jump on with his back facing the control panel — no support — the predictable results were a quick ride that sent him sprawling. YouTube user Nikkid06 insists that no baby brother was injured in the making of this video, but one thing is certain: we wouldn’t want to trade places with him. If you gave an A for effort, then yellow lab puppy Dugan couldn’t be included here because there is no quit in this little fellow. In that sense, he doesn’t fail. However, he doesn’t really master the art of walking on a treadmill either as evidenced by what happens when he finally fights his way to the front of the machine. Feeling accomplished, he stands there in victory until the band has other ideas. Originally appearing on Refrigerizer’s channel, this video has since racked up more than 20,000 views. Looks like everybody loves an underdog! 4. Guy Falls Off Treadmill Looking At Girl. A Classic! Oh who cares if it’s real or not! This hilarious treadmill fail was executed to perfection, and it never gets old. It’s hard to pinpoint the original source. You can find versions of it all across the web, but one of the most widely viewed comes from YouTube user Siddhesh Guldekar. According to the Mirror, the video in all its incarnations has 700,000 views and counting. The setup: a man gawks at a pretty lady walking by while getting in a run. The treadmill promptly punishes him for it, but when the lady turns around to check out the commotion made by him falling off, he makes a quick save. No matter how you feel about George Gray’s announcing duties on The Price Is Right, you’ve got to give the man credit for busting it while showing off a treadmill and not missing a beat. That was in spite of Drew Carey’s and his contestant’s reactions. (Not to mention the fans!) Gray continues with the whole spiel in spite of what was, quite clearly, an accident. He even manages to turn it into a joke at the end. Still, that hasn’t stopped him from living on in YouTube infamy. If you thought the lab puppy trying to figure out a treadmill was cute, then you won’t know what to do with this pit bull pup. Originally posted by PeaceLoveandPitBulls.org, this adorable little guy just wants to be like his big brother. Each time he experiences the same result — a 3-second ride from back-to-front, front-to-back. Particularly adorable are his frustrated, half-hearted attempts at boarding the treadmill with one paw when he just can’t figure it out anymore. If you love dogs, period, you should get a kick out of this. Some things are just too painful to watch, and this could fall into that category, unless you take pleasure in the misfortunes of others. The “misfortune” here happens in the background of an interview that gets completely overshadowed when the poor guy jumping on the treadmill is dumped on his face. Unfortunately, the video, originally posted by Encik Mono, cuts off before we find out if he’s okay. But he certainly doesn’t appear to be moving at the end of it so draw your own conclusions. Let this video be a note to all parents. Don’t try anything that could end up putting you on your backside while your children are filming you. If so, you could end up hearing something like the dad here does from his daughter: “I’m so putting this on my YouTube Channel!” Dad takes it in stride, though, which is good because the spill didn’t look like a very pleasant one. “Robyn” from this video doesn’t fall till the very end, but there is a whole bunch of “fail” in that form! For most of the clip, it appears as though her legs are moving three times faster than the rest of her body. Then she pulls out the cheerleading stunts, and from there, well, you know what’s about to happen. That said, one thing she doesn’t fail at: having fun! Originally uploaded by YouTube user “Gabby”,the poster admits that she doesn’t know the people featured, “but couldn’t stop laughing” once she saw it. Understandable, especially with how this 40-second clip ends. The payoff is reminiscent of our “Broken Break Dancer” from No. 1. Fortunately, no one was hurt beyond ego, but a valuable lesson was (hopefully) learned: don’t place your treadmill so close to a wall or you will eventually pay for it. The two brothers in this video are a little too big to be riding the same treadmill at the same time, and that’s a fact made painfully clear when little bro starts to lose his footing. He then uses his older brother for support, but doesn’t find much. What happens next is YouTube gold, brought to us by YouTube user Eric Bumphrey. Not sure if Eric is one of the two involved. He’s certainly not messing up on the video description, so we’re going to take that as a maybe. 12. Handstand On A Treadmill. How Do You Think It’s Going To Turn Out? Sometimes you have to think the sole purpose of the Internet is to capture in full glory the stupidity of Man. Wherever there is a video camera, there is a person willing to do the impossible (and reaffirm why people label it “impossible” in the first place). Such is the case with this unnamed young person, who foolishly tries to do a handstand on a speeding treadmill. YouTube user NASTY THE HORSE was kind enough to give us this treadmill fail in both full speed and slow-motion versions. The slo-mo is classic, though it does make you want to find the nearest available ice pack. Ouch! While most of the entries on this list are videos, there was no way we could get through the entire thing without offering up one of the most painful GIFs ever posted. This comes by way of Red Dragon Gym. What we have is a man trying to keep pace with a speed that’s well beyond his training. When it becomes too much, the results are downright brutal. He was very lucky to walk out of this alive, especially since it appears as if a bench press bar fell on his neck. It doesn’t get more painful than this. Credit where credit is due. The young man on the BMX is doing a fine job of keeping pace with the speed level on his treadmill, but then he has to get fancy. While he may have walked out of this unscathed, it definitely doesn’t look like he stuck the landing. This item originally appeared on GIFBin and has, over the years, became a Reddit favorite. Was it worth the wait? The Internet disagrees. With more than half a million views from its original appearance on the Nigel Nuttcrusher video blog and countless reshares across social media, this is undoubtedly one of the funniest treadmill fails of all time. See for yourself. So there you have it, fellow treadmill enthusiasts — the 15 Most Hilarious Treadmill Fails of All-Time. While each one is good for a laugh, though, remember not to try any of this stuff for yourself. The scenes captured were attempted by non-professionals, and you saw how that turned out. What was your favorite, and which fails should have made the list? Sound off in the comments section below!